GASTRONOMY by Joy: Robinsons Mall Las Pinas, A Foodie Haven Too! 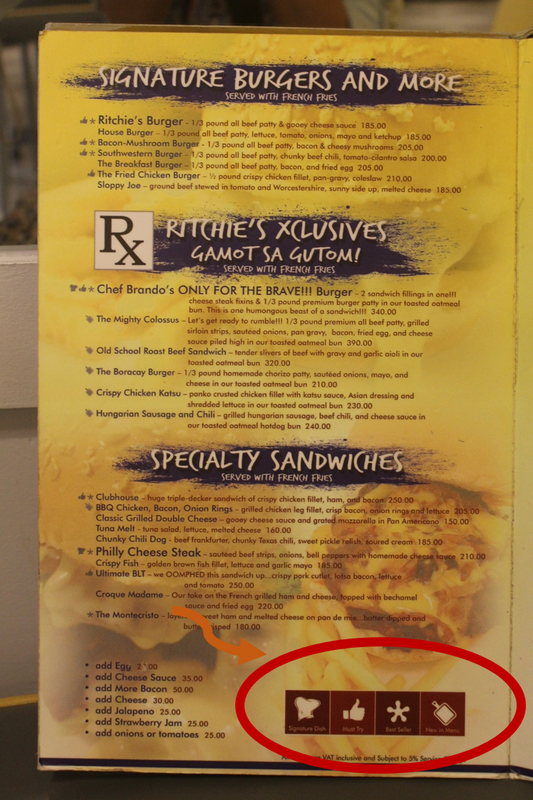 Probably not many know that there are rave-worthy food establishments that are housed at Robinsons Mall in Las Pinas. Like many other malls in the metro, it serves as a one-stop retail complex where you dine, shop and be entertained while being sure of safety and security. 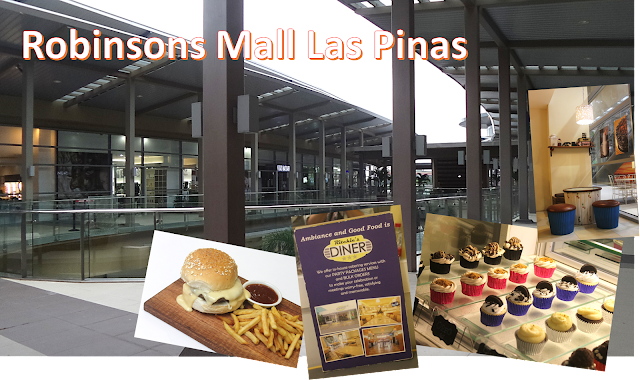 Just a year ago, Robinsons Land Corporation opened up the Las Pinas branch of Robinsons Mall. Behind the sleek and modern design of the building structure is their corporate mantra of improving and making life more meaningful for the Filipino people, thus a shopping experience like no other. Personally, I find the place so comfortable and it's not crowded, meaning, there is a lot of breathing space around and in between alleys. Another major element is good lighting, incorporating natural lighting is a plus. For the foodies and gourmands who loves trekking down south to BF Homes, let me share you the good news. Some of BF Homes' beloved restaurants and cafes have either branched out or moved to this mall. Just above the basement parking, right off the escalator and on to the right, you will be led to the al fresco dining center, where esteemed food establishments are located. I took two flights of stairs from the basement, which was near the Admin. Office and just right off the ground floor is the door leading to the al fresco dining of the mall. 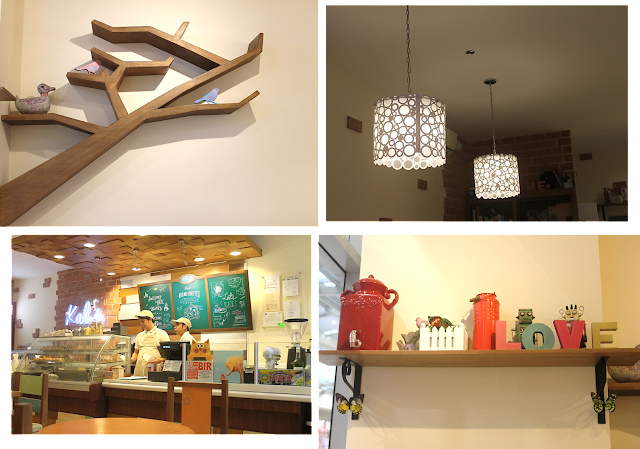 The first signage that welcomed me was Kat's Café, and I felt instantly right at home. 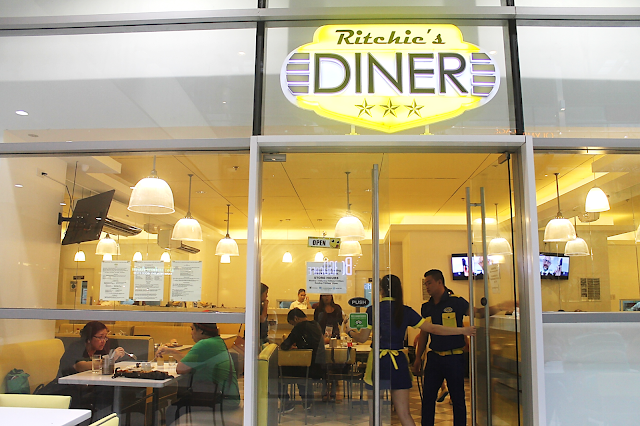 Lined up beside it are more interestingly themed restos, such as Viet Nam Deli, and Ritchies Diner. While parallel them are Borgo Café, The Urban Farm etc. and Bonchon is at the end. On that same visit, eventhough a storm was announced, I tried two restaurants that apparently came from BF Homes food alleys. Isn't that just amazing! You don't have to face the crazy traffic to visit them in Paranaque cause Robinsons was so kind enough to bring them to us. 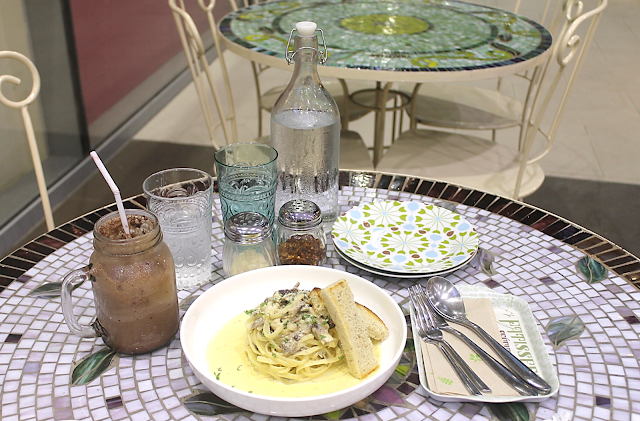 So, we can shop till we drop and savor great food while we're at it. Did I tell you, I have something for all that's gray and yellow? I love, love the combination and it was right smack at my face and into my heart when I entered this truly American-inspired diner. The contrast of basic white background to the pale yellow and gray is just so pleasing to the eye. The tray lighted ceiling and the pendant lights above each cubicle and table give the bright lights any diner needs. This is their second branch to date and like what I've mentioned their first is at BF Homes. 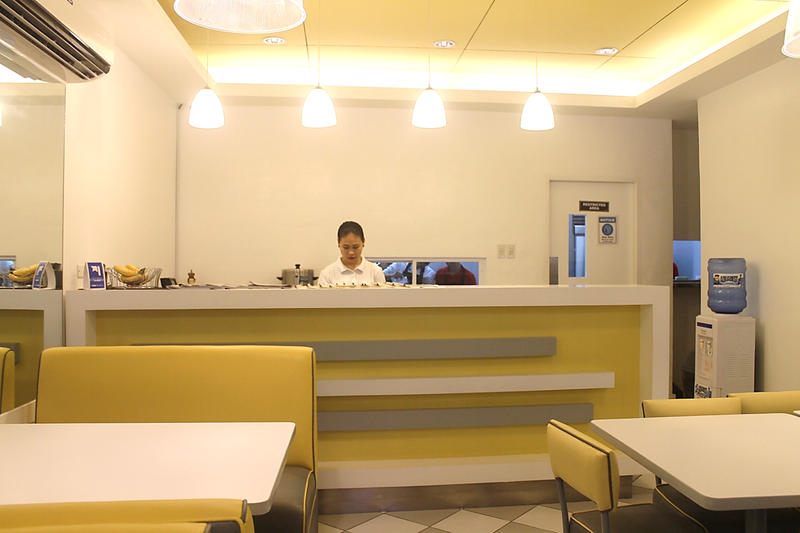 according to the owners, they are putting up another branch somewhere in the north soon. Nope, for now, franchising is still not in their mind, even though many have asked. Boasting with this platter of huge buffalo wings, Ritchie's Diner seemed to be impressing me already. Excited me, I had to take the first buffalo wings. 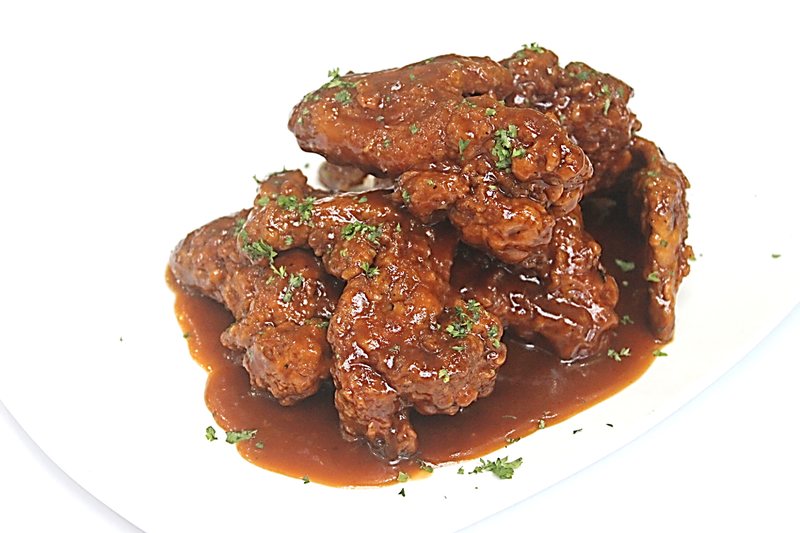 The image of perfectly fried to crunch, large-sized chicken wings soddened with what seemed like a demi-glace or a dreamy barbeque sauce was like being in the best children's party ever! If this isn't my treat for braving the storm on a super traffic Saturday, I don't know how to define the word treat is. It didn't disappoint! The batter was enough to cover the meat and accommodate the sauce. Even with the sauce smothered all over, the outside remained crunchy to the bite, with the meat inside that's tender and cooked aptly. Oh my poor husband, who had to fix the car while I was savoring this wasn't able to try this. I guess we have a reason to be back here. You've to choose how you want it served, mild, hot or raging hot, we had only the mild spiced platter. The sauce is Ritchie's secret that has a foolproof balance of sweet and spicey. You can order in platters of 4, 8 and 10 pieces. I think I have too much praises for the chicken wings, well cause they aren't called buffalo for nothing, 'ya know! Of course, I had to try other best sellers. On the menu, to get the best out of your meal here, look out for images that would suggest signature dish, must-try, best seller and new in the menu. 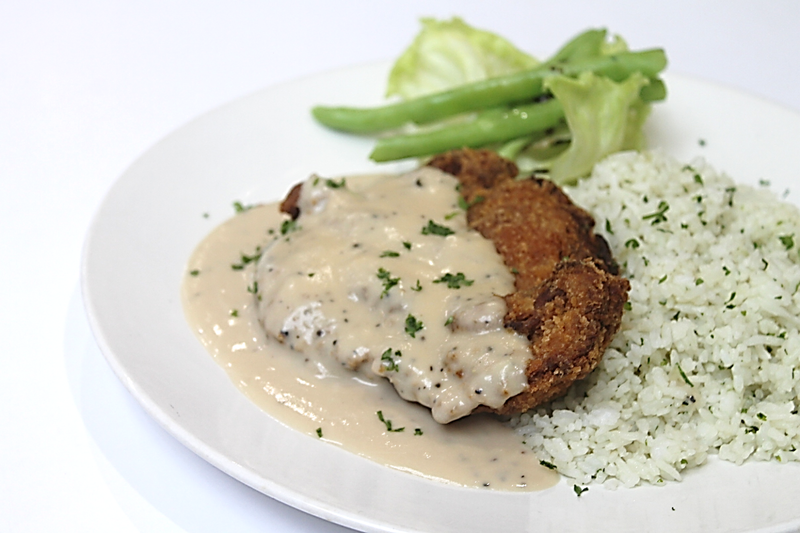 Southern Fried Chicken Steak (P 250) would probably be a hit with kids once they have it tried. I love the crunchy chicken coating that taste just right, giving enough umami. To give it more panache a white sauce graces the chicken and rice pilaf plate. The creaminess and milky taste of the pepper gravy gives a different take to savoring a not so ordinary fried chicken. 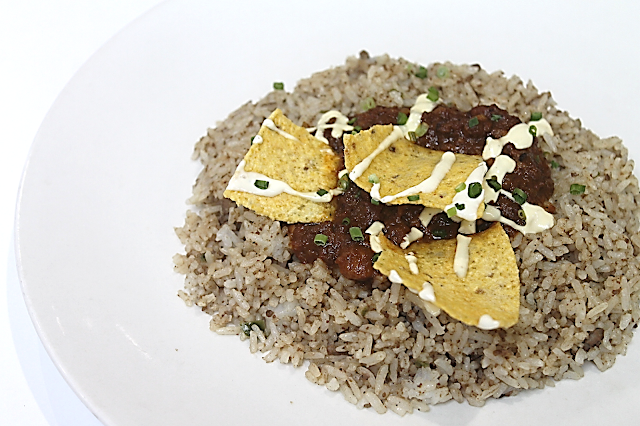 Have you ever considered having your chili with rice, on a plate, not in a buritto way? In my course of finding the right food for my family, I once saw my son spreading left-over chili on his steamy rice, I guess I can learn a few tricks from them. So when I saw TexMex being laid on our table, I instantly thought of my son. Tex Mex Plate of Chunky Beef Chili says all about the plate. A hefty serving of dirty rice topped with mildly spiced chili. The chili's thick sauce cloths the aptly cooked red kidney beans with nicely grounded beef. The nacho chips gives a clever decoration and the cilantro crema gives it a different twist. Much to my demise, after all the gorgeous flavorful manly/carnivore meals, they somehow missed to give some oomph to the dessert. 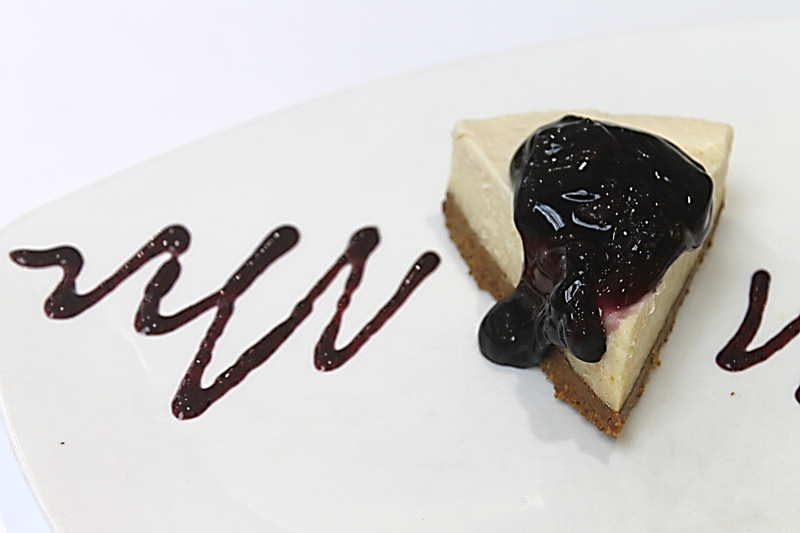 It's a refrigerated cheesecake, made by one of the owners. I'm not a fan of refrigerated cakes, since I'm more inclined to baking. I you want a really good cheesecake you may want to check this link. Good thing Kat's Café is in the same venue, practically a couple of steps from Ritchie's Diner. 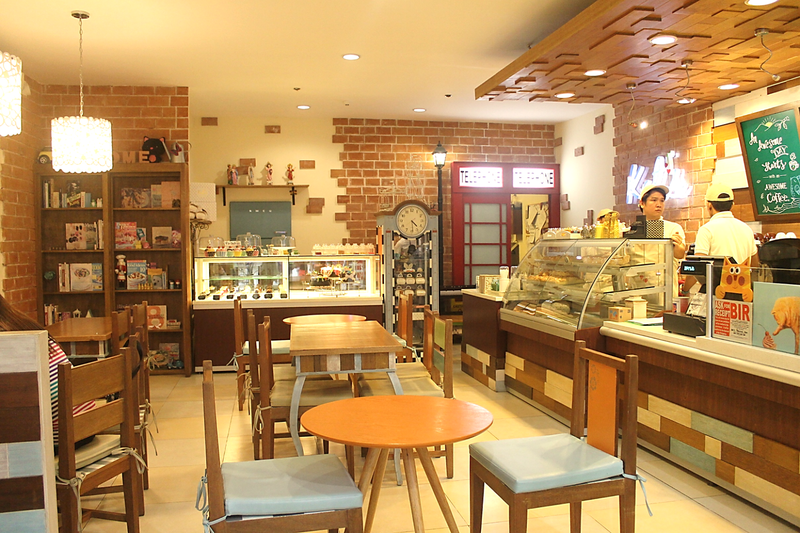 Kat's Café is a dream child of Katrece Gamo and pays homage to her creativity and passion for baking. Like any other dreams, this didn't emanate overnight. After pursuing a course in Photography at College of St. Benilde, she went on to study culinary at the same school, since her course is a combination it was easy for her to transfer to culinary, however it was with pastry that won her heart. 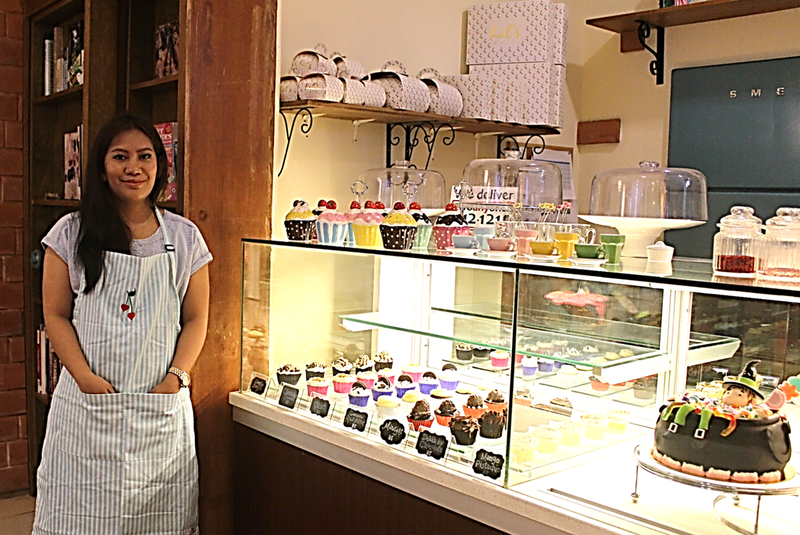 This month they will be one year old in Robinsons Mall, though they have been serving up sweet stuff for two years already. 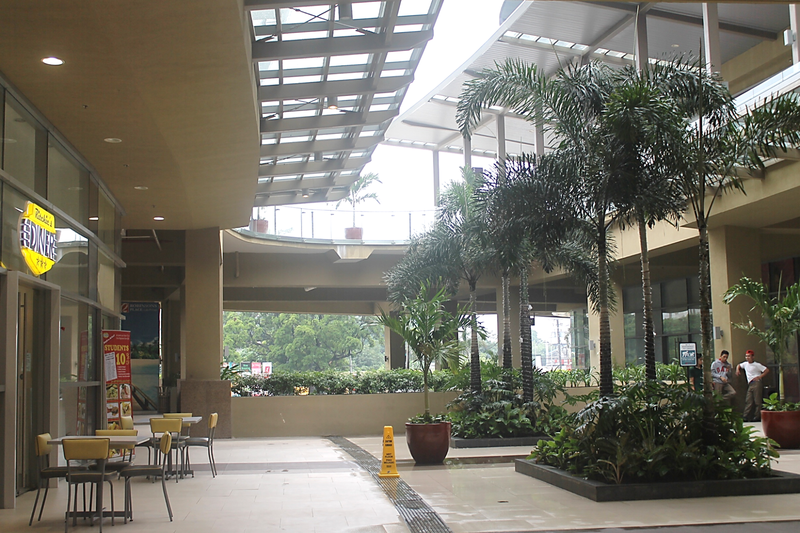 Before finding home at this mall, they were situated at BF Resort Las Pinas. Sticking to the original concept of a café, they limited their menu to hot and cold coffee concoctions, beverages, pastries, of course and savories which comprises pastas and sandwiches. As Kat tells me her fondness for Alice in Wonderland, my eyes wander around in admiration of how she was able to pull up a quirky yet rustic interior. She said, she dedicates the design to her twin daughters. As a matter of fact, they are imbedded in their cafe's logo, as the two cherries that artistically serves as the apostrophe. If you have been one of those who have tried them at their defunct location, you may notice some of the conversation pieces they now have in the mall, such as the telephone booth sliding doors, the grandfather clock inspired glass showcase and many others. Her artistic skills and eye for good design made the café so inviting and good venue for get-togethers, or just some quiet moments of me time enjoying great food and bevs. Like a perfect blend of coffee is how she and her partner made the café concept successful. While she conceptualizes on discriminating choices of pastries and the menu, Joseph works behind the coffee maker and whips up their unique drinks. Nope, I'm not referring to The Muppet's Miss Piggy, it's a cool, err, cold glass of Bacon Milkshake. 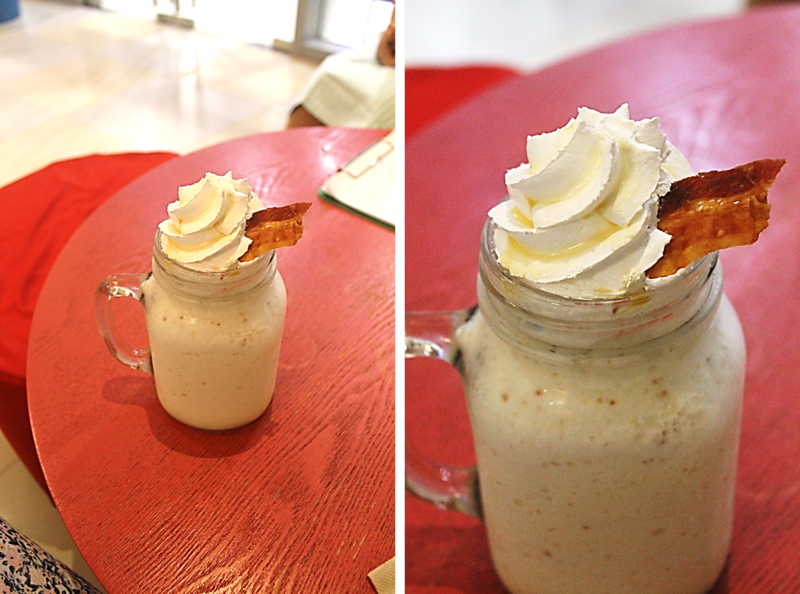 It's really a cool take on Vanilla Milkshake, toned up with a light bacon flavor. To point on the bacon, it actually was perfect match to the sweet mix yet gives a subtle contrasting flavor to the milk. Kat was so genius in that she used a bacon that's not too salty and sweet, oh and yes, you'll be surprised at how smooth the blend is and not a hint of the bacon oil. This wasn't really her invention as this was inspired from another café where she and her girls had tried it. Apparently, they didn't quite enjoy it cause they didn't find any trace of bacon in it, so she decided to concoct her own version, since they all love bacon and milkshake. Yes, my kids will love her, as they also highly favor both. So expect that you'll enjoy this huge jar of a milkshake the way I did. Along with that is the iconic French pastry - cream puff. That wasn't the end of it. I got so enamored and sad at the same time, that my husband wasn't able to join me, so I came back with him a couple of days after and tried some other stuff on the menu. An afternoon fix for coffee after shopping at Robinsons Mall Las Pinas became a hefty meal with my hubs. This time, I got to try something under the coffee list. I had a blended cold Dark Mocha. 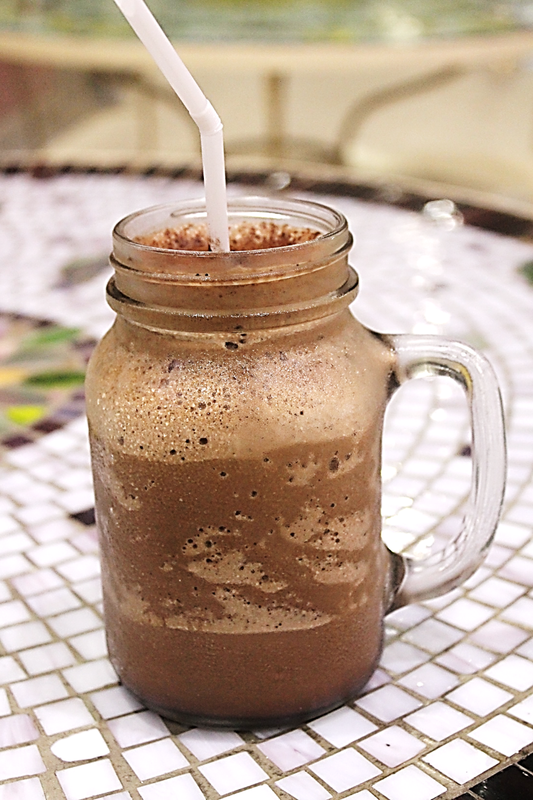 As soon as Joseph came to our table outside the café and handed my cold concoction, he said, "Here is your ice-blended Dark Mocha, a good choice, enjoy," I knew, I'm in for a treat. And indeed it was such a treat. Every sip contains pure yet dark love of cocoa bits. I can tell that cacao tablea was used in the mix and I love how t taste like the local tablea we would use in our champorado. The mix was well thought of where coffee and chocolate is in balance. One one hand, Bhogs had a flat white. I won't divulge so much on what a flat white coffee is compared to other kinds of coffee, rather I would share an experience. A flat white is more like drinking a strong, sharp, shot of espresso but with lingering sweetness and creaminess, way better than drinking a cappuccino or latte. Notice the orangy caramel milk froth on top? 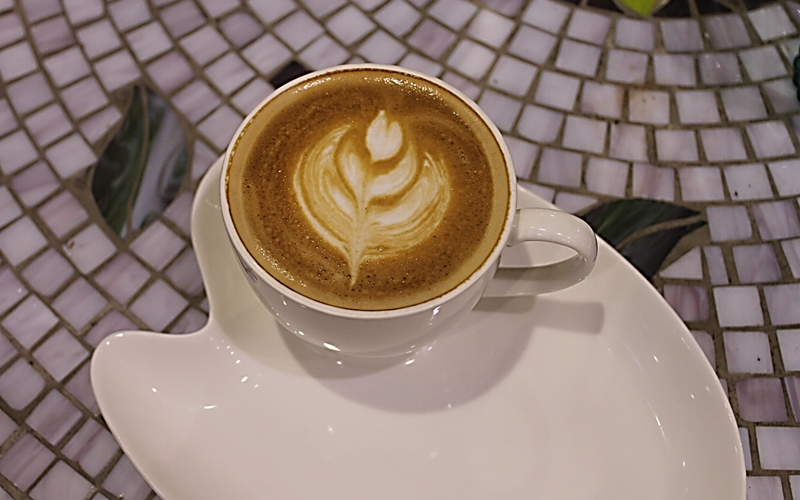 It's what coffee connoisseurs call "crema," and it's what makes the whole experience of drinking at white different, it's the coffee plus the creamy foamy, mouth-feel. 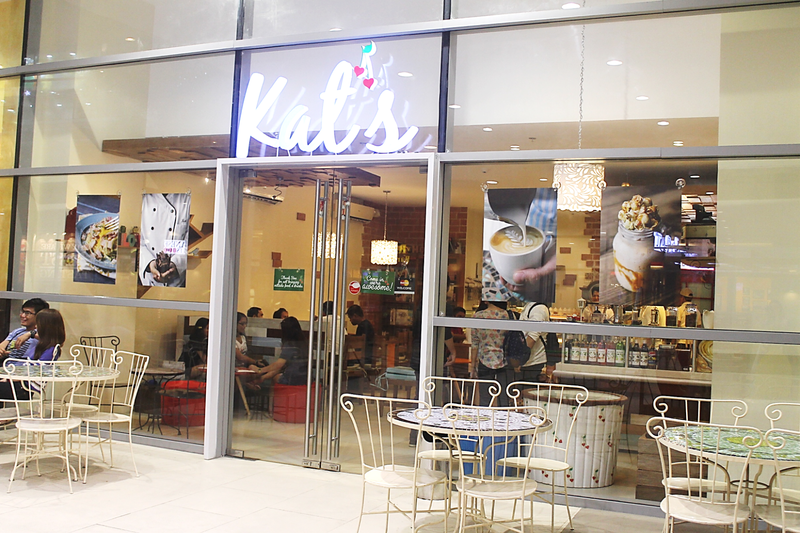 Before other international coffee franchises came to bring Flat white coffee here in the country, Kat's have been whipping it up already. I just have to have a photo of the spread sans Bhogs coffee on the tiled table. And those white-painted Batibot chairs added more rustic flair to the dining set. We got to share with a plate of Mushroom Trifolati. Originally, a funghi trifolati, cooked traditionally by the Italians are simple sautéed mushrooms served with any pasta of choice. However, I like Kat's Café's version better which is made creamier and thick. I like how simple this dish is with only olive oil and mushroom plus the cream and cheese, but it may not appeal to other diners, I would suggest sprinkling it with bacon bits or reinventing it more by adding bits of meat. The stunning plating will make you appreciate this dish more and oh, thanks btw, for putting a lot of white sauce, we swiped the plate off, the sauce is something you'll definitely love. I reckon, you might say, it would look more like a regular Carbonara. But, let me clarify that Kat's Carbonara is prepared the Italian way, using only eggs to bind the pancetta (or bacon) to the pasta, no creams or what not. 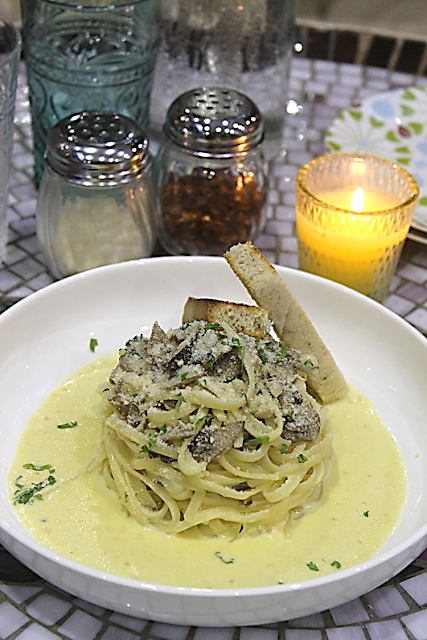 Of course, we ended that carbo-rich afternoon snack with another luscious carbo treat. Hat's off to Kat for a perfection, the Taisan Cake. My kids were raving about it, when I went home with a loaf on my first experience with Kat's. They call it, light orangy cake. 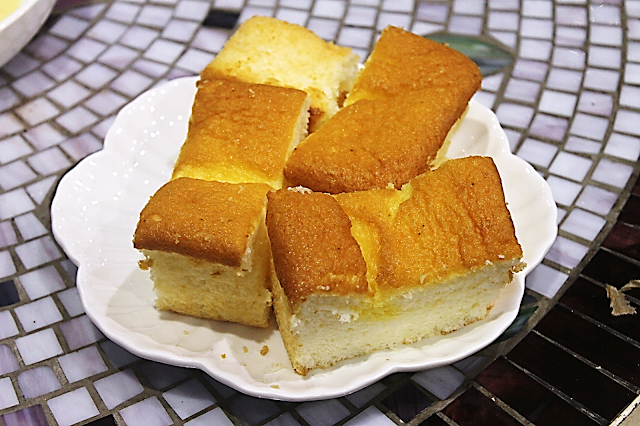 A big bite of the airy and spongy cake conjures up time when I first tasted my mama's baking, and the main reason why I learned baking. Another bite, getting a whiff of the lemon and orange flavor, made me remember the times when I was baking Taisan Cake for the first time. I just couldn't remember if it was this good though. 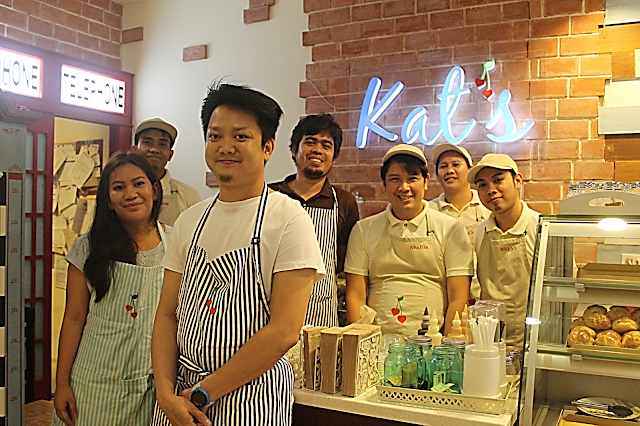 You'll be surprised to see that Kat's crew is comprised of all guys, she's the rose among the thorns, so they say. With a pastry line-up that are to-die for, not too sweet and savories to match their drinks, there are so much more to their products. Kat can also customize your cake for any occasion, she can even whip up gluten-free and sugar-free stuff. There was also a time when she made treats for dogs and cats on a certain event at the mall.